The 13-year-old district level Kachai Lemon Festival, which is organised at Kachai village in Manipur’s Ukhrul district, will be held at the State level from the next year. This was announced by Manipur Horticulture and Soil Conservation Minister Th Shyamkumar while inaugurating a rural market shed constructed under the Mission for Integrated Development of Horticulture (MIDH) scheme at Kachai village on Friday. The festival is aimed at promoting and encouraging lemon growers in the State, particularly in the Kachai area. Appealing to the villagers to produce more lemons, Minister Shyamkumar said the lemons from other places are different in taste and the fruit is truly a ‘gift of God’ to the villagers. On the bad road condition, the minister assured that the matter would be discussed with the Manipur Chief Minister. On the demand for the aggregation unit, he assured of Rs 11.25 lakh for the construction of such unit in the village advising the villagers to use the remaining fund for construction of toilet in the suitable area. Handing over a cheque of Rs 6.45 lakh to the village headman from the Environment Department for the construction of water body, he also announced that Manipur Organic Mission Agency (MOMA) would provide pest and disease management materials to around 500 farmers of the surrounding areas including 200 farmers of Kachai. 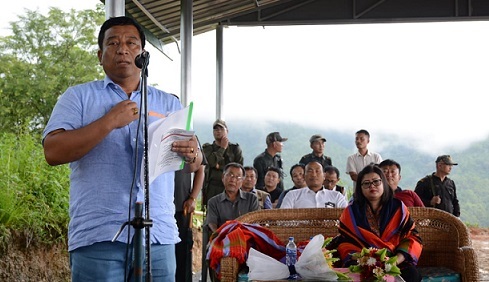 Ukhrul District Officer M Kirankumar Singh of Horticulture and Soil Conservation Department said the rural market was constructed under the MIDH programme for the year 2017-2018 and he hoped that it would help the villagers to sell their produces and help in increasing their income. He said the construction work began on July 23, 2018 and it was finished on August 23, 2018. Stating that there is need of producing lemons using grafting technique, he informed that the department was planning to produce grafted lemons in Kachai from January next year after successful production in a farm in Mahadev area. He also informed that citrus fruit fair would be held in December. Students of Alpha Christian English School presented a special welcome song during the inaugural function which was attended by Project Director MOMA, K Debadutta Sharma, Divisional Forest Officer Ukhrul including officials of Horticulture and Soil Conservation and Forest Department and villagers of Kachai.